When Ko Myint Thein Htun went into the family cotton weaving and clothing retail business from the shores of Shan State’s Inle Lake, he did not think he would be doing the same thing some two decades on and helping his village develop along the way. By using some of the same cotton and silk weaving practices, Ko Myint Thein Htun, known locally as Ko Nge, believed he could also make a successful business of weaving scarves out of lotus fiber threads. The lotus flower is a powerful symbol in Buddhism; its threads have traditionally been used to weave only monks’ robes or cloth for draping Buddha images. The practice was started some 150 years ago by Daw Sa Oo in Kyaingkhan Village. She would strip the lotus fibers to make the threads and spend the next year weaving them into a robe for an abbot she revered. The threads came from a sacred lotus — Nelumbium speciosum, or Padonma Kyar in Burmese — that grows on Inle Lake. It is believed that lotus fabrics help keep the wearer warm in the winter and cool in the summer. They are also said to bring good luck, absorb negative energy and dissipate body odor. The whole process — from picking the lotus plants to stripping the fiber from the stems to the weaving — is all done by hand and is environmentally friendly. Because of their delicacy and uniqueness and the time it takes to make them, lotus fabrics are expensive. It takes 8,000 stems and 20 days to make a single square meter, said Ko Myint Thein Htun. 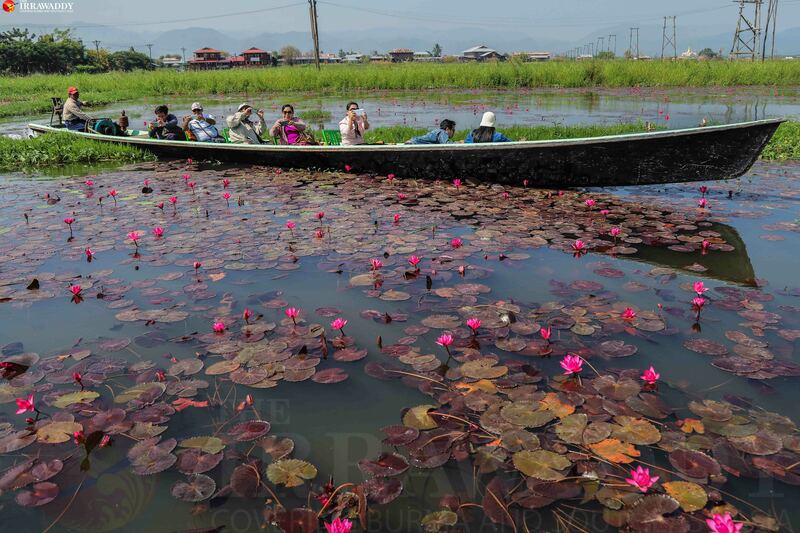 Even so, his lotus and lotus-silk scarves have attracted ever more buyers among the growing number of tourists visiting Inle Lake since Myanmar opened its doors to vacationers in the 1990s. “They want something small, a souvenir that they can use or give as a gift,” Ko Myint Thein Htun said, recalling how the idea of making scarves instead of the much larger monks’ robes came to him. Many of the traditions of Inle Lake’s Intha, from their floating markets to their unique way of rowing their boats with their legs, have been fading away over recent decades, a trend only amplified by the new jobs on offer in the area’s ever-expanding tourism industry. Their weaving goes back a century. Ko Myint Thein Htun’s great grandfather, U Han, started weaving in 1910. He was one of two men who learned how to weave the ikat design in Thailand in the 1930s and taught it to his neighbors back home. The Inle ikat, or Inle Zinmae, longyi has since become popular across Myanmar. 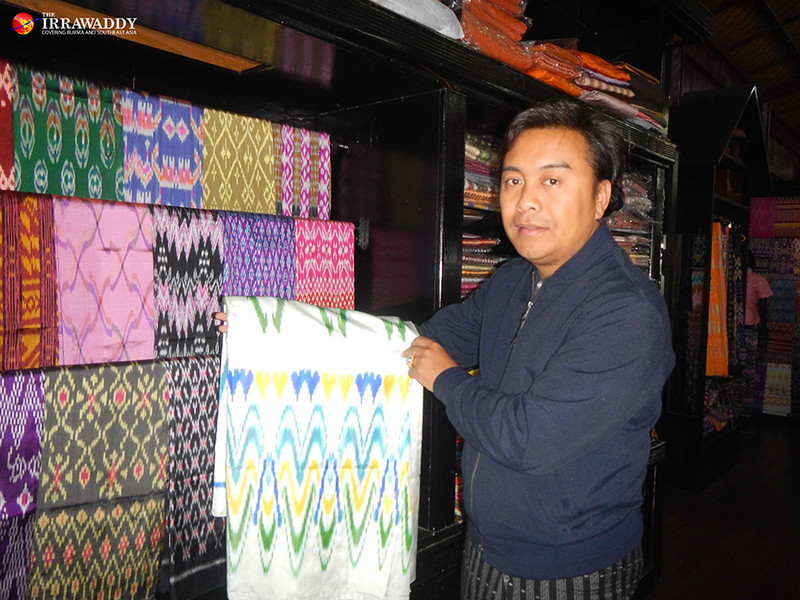 Ko Myint Thein Htun is proud to carry on the family’s weaving tradition. When Myanmar’s universities were shut down in 1996 because of a wave of student protests, the fledgling tourism sector helped Ko Myint Thein Htun, a student at the Mandalay Arts and Sciences University, set a new course. At first, back home in Inpawkhon Village, he believed the universities would reopen soon and that he could continue to pursue his studies. But the universities stayed close for the next three years and eight months, during which time he entered the family business, making cotton bags and clothes and selling them in Yangon, Mandalay and elsewhere. He soon ventured into lotus fiber and in 2000 opened a souvenir shop, Khit Sunn Yin, with a loom to show tourists how the fabrics were made. 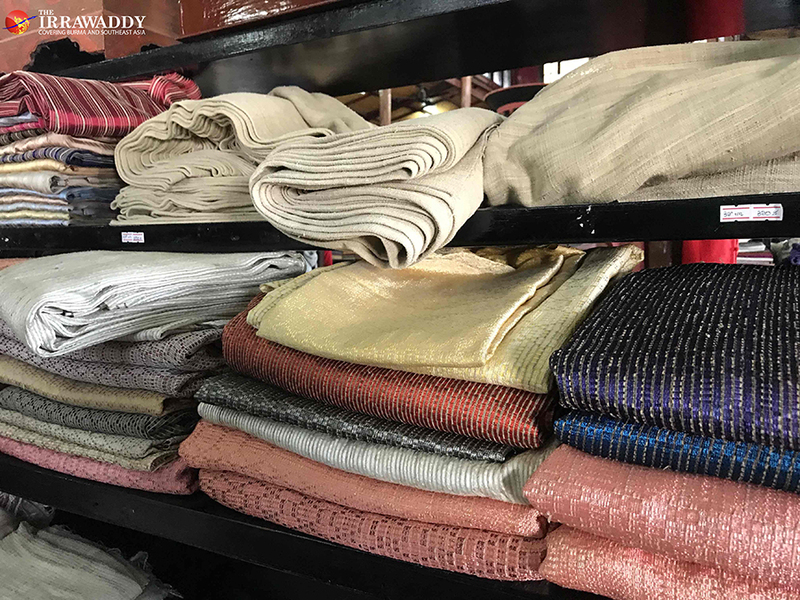 As one of the few shops still weaving by hand, its fabrics have also become popular with local actors and singers and other well-to-do domestic customers. Myanmar’s lotus fabrics have also been used by international clothing brands Loro Piano and Muller and Sohn. But Ko Myint Thein Htun’s business has seen both ups and downs, all in tune with Myanmar’s political and environmental fortunes. Business dipped along with tourist arrivals after 2007’s so-called saffron revolution and Cyclone Nargis the next year but bounced back in 2010 and has remained stable since. When demand for his products eventually outstripped his ability to meet it, Ko Myint Thein Htun encouraged his fellow villagers to start weaving as well and offered to help them sell what they made. And so he did, handing out loans of 740,000 kyats (about $491 at today’s rate) per family in 2016 to set up and repay him with finished textiles, creating about 200 jobs in the process, mostly for women. He also runs dozens of looms of his own now in a workshop next to his clothing store and employs more than 120 people directly. 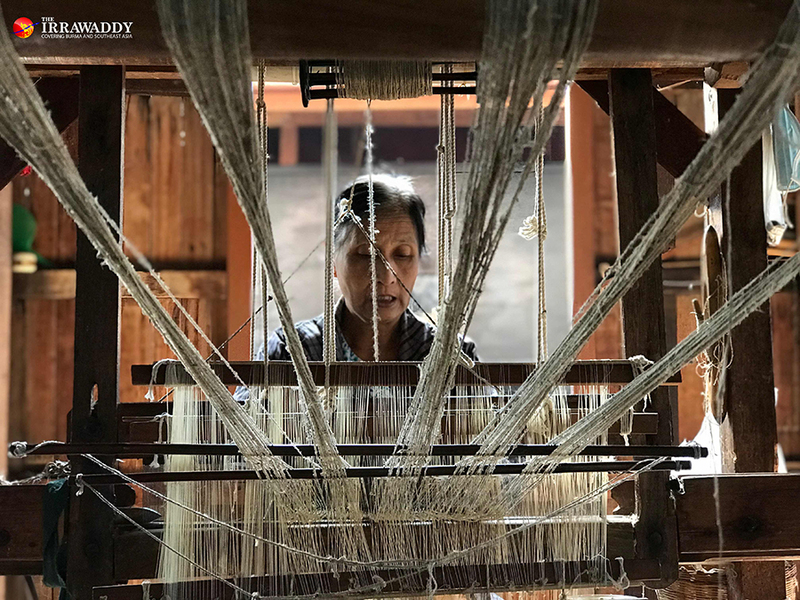 In the workshop, the older women mostly turn the lotus threads into yarn or weave while the younger women prefer to fashion the woven fabrics into clothes. 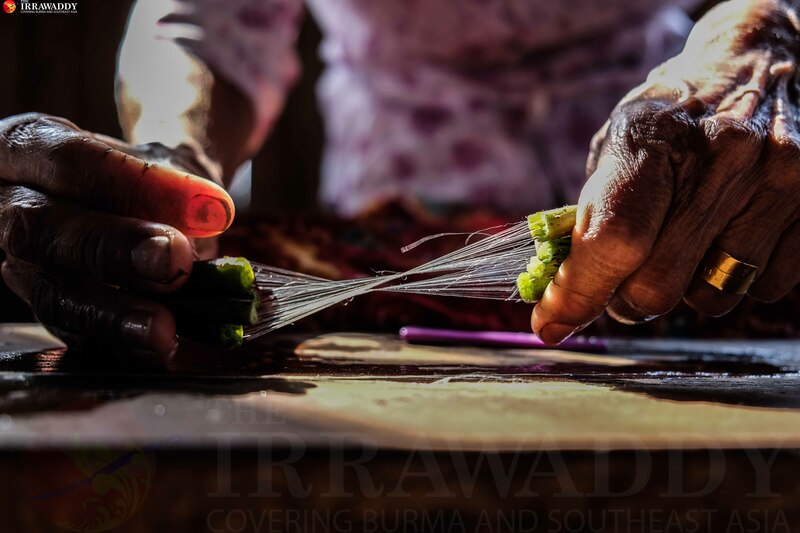 “Many people, including the older ones in their 70s and 80s, can still earn their living because they can work either as lotus-plant pickers and gatherers, strip lotus stems for thread, weft the silk yarn and weave at home,” said U Aung Kyi Win, an ethnic Intha elder and former state lawmaker for Nyaung Shwe Township. And as the product has become more popular, the supply chain has grown longer, he added, with lotus stems now also coming from as far as Bago and Mandalay regions and Kayah State. Through his community development and social support, Ko Myint Thein Htun urges young people to learn traditional handicrafts. He has started offering 1,000-kyat bonuses on top of the daily wages at his shop to encourage the next generation of weavers, including young women and mothers with babies. More than 20 young men and women showed up last year, but the number has fluctuated with time. While the numbers may be low, the effort is helping to raise awareness of the importance of maintaining traditions and spreading his believe that the handicraft industry is good for the community. He is currently promoting another local custom to outsiders — the floating Thingyan. Most people in Myanmar celebrate the annual water festival on land. But given the large lake at and under their feet, the residents of Inle celebrate on the water itself. When the festival kicks off this weekend, the Inlay Cultural Heritage Trust Complex in Nam Pan Village will host a floating Thingyan for the first time thanks to Ko Myint Thein Htun’s efforts. Anyone visiting the village by boat will get to splash fellow visitors on other boats. His Miss Inlay Organization will also be running a beauty pageant to draw in yet more crowds and raising awareness about the importance of saving Inle Lake from rising pollution levels. Ko Myint Thein Htun believes his weaving business is beneficial not only to him but to the whole community around the lake and to the country for helping preserve traditional handicrafts. “It offers people jobs. It earns foreign currency for the country. It keeps our traditions alive. That’s why I stick to it even if there is something better for me,” he said.